(Nanowerk News) Some of the world’s most popular foods and seasonings can also be the smelliest — think garlic, onions, certain cheeses and the notoriously stinky Asian durian fruit. No amount of plastic wrap seems to contain their stench, but now scientists have developed a new film that could finally neutralize the odors of even the most pungent fare. 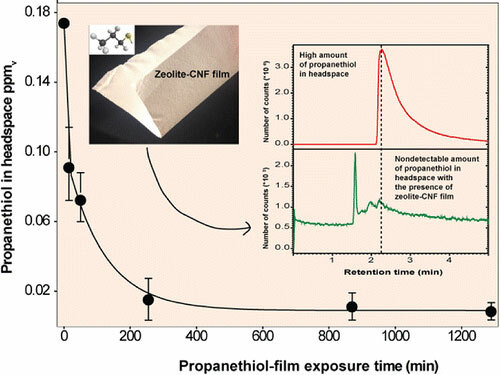 They report their progress in the journal ACS Applied Materials & Interfaces ("Nanocellulose–Zeolite Composite Films for Odor Elimination"). The fetid smell of some foods makes it difficult to take them anywhere without offending others such as fellow train or bus riders. But tastes are growing more global, so scientists are looking for ways to transport and store reeking edibles without overpowering the senses of people nearby. They’ve tested some materials, but their success has been limited so far. Lennart Bergström and colleagues wanted to come up with a better packaging solution. The researchers developed a film out of zeolites, which are microporous solids containing aluminum and silicon, and cellulose from wood. Testing the material showed that it could trap the sulfur-containing compounds often responsible for bad food smells. This adsorption reduced odors to levels below what humans can sniff out.